The above image was taken with a D90, pop-up flash as commander, and a SB-900 held out at camera left. I think that there is something wrong with these photos, but the subjects liked them. My issue? There was too much flash, especially from the front, and there is a shadow at the bottom of the image. But why? I was certain that I read somewhere, saw a video, or a podcast that said that the D90’s pop up flash, when acting as a commander could not contribute light to the scene. I was wrong. At home, I had previously been trying to use a two light setup with one light on camera, and another off to the left in an umbrella. Both were SB900’s. I had been playing with the lighting ratios, and what the light looked like. I would leave the umbrella at full power, then decrease the on camera. Then I would lower the umbrella, and increase the light from the on camera flash. This was all done via CLS. 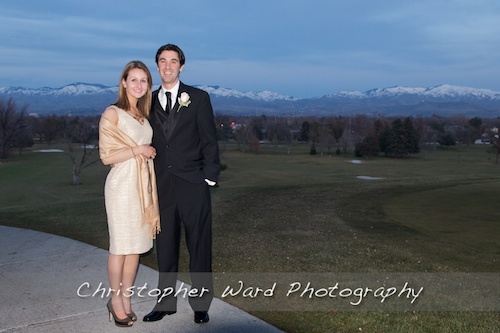 Then I was shooting some informal portraits at a wedding. We were at a country club, on a golf course, and the sun was going down. Twilight blue sky. 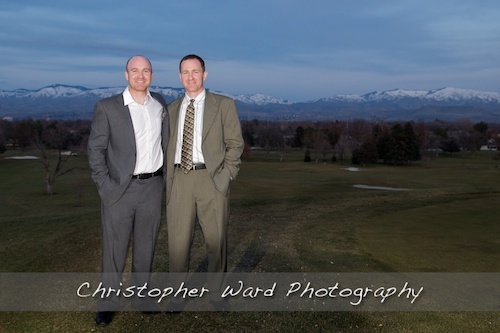 I set my subjects up with the golf course and the mountains behind them. I held a SB900 with dome difuser on in my left hand at arms length. (I didn’t have other diffusion materials with me.) I popped up my on board flash to use as the commander. It didn’t register that it was set to TTL. I took my picture with a Nikon 17-55 f/2.8 lens on the front, and a shadow shows up in front of their feet! Whoa! Where is the light coming from? I was a little confused and didn’t have time to figure it out, so I just zoomed in a bit more so the shadow wouldn’t be as noticible. I also added some dodging in post to even out the light a little bit. It wasn’t until I was back home looking at my pictures that I figured it out. The light from the built-in flash was contributing to the exposure. I know that in the past I have sworn at Joe McNally because it seemed like my flash was contributing to the light, when I know that he has said over and over that when using CLS, the commander flash doesn’t contribute light to the exposure. Except when you don’t pay attention. So, if you do not want your pop up flash to contribute to the exposure, make sure that beside the line labeled Built-In, in the left column it says “–“. If you do want some light from this flash, set it to “TTL”. You will most likely want to lower the light from this flash so it acts as just a bit of fill, by setting the right column to -2 or even -3. I think my mistake (probably more than once) was when I looked at the menu and saw TTL, and thought, of course that is what I want. But, you probably only want light from the off camera lights set to TTL, and the pop up set to “–” for commander. The most I can hope for is that I have learned my lesson. 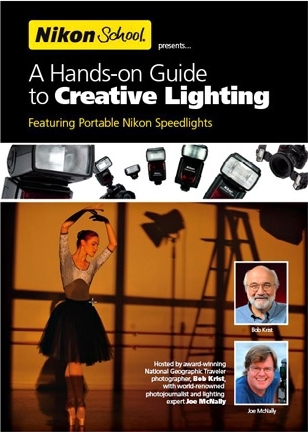 I just finished viewing the Nikon DVD called “A Hands-on Guide to Creative Lighting”. You can see excerpts of this DVD from Nikon here. You can get it for around $30. (I got mine from West Photo) This DVD features the host, Bob Krist, and Joe McNally. This is a pretty good DVD, with something in it for everyone. Probably not for the ripest beginner, or the most advanced flasher, because it covers a lot of ground. A beginner or intermediate photographer with a speedlight or two willing to pause, stop, and rewind this DVD a few times will probably get quite a bit out of it.